M.N. Renevier, N. Lobiondo, V.C. Fox, D.G. 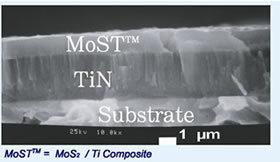 Teer, J. Hampshire: Performance of MoS2/metal composite coatings used for dry machining and other industrial applications, Surface and Coatings Technology, 123 (2000) 84-91. Copyright (C) 2006　Adachi New Industrial Companies. All Rights Reserved.